On April 11, 2016, Dr. Hassan Al-Bilawi, ACCD's Secretary General, and H.E. 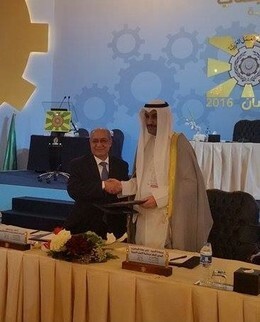 Fayez Al-Mutairi, General Director of the Arab Labor Organization (ALO), signed a joint protocol of cooperation on the sidelines of the Arab Labor Conference in its 43rd Session, held during the period 10-17th of April 2016, in Cairo. "Media and Violence against Children"